Since it is the first day of the New Year as I write this, I should ask what you have planned musically this year; any new releases to look forward to? When I was in the 5th grade guitar lessons were suggested and I dutifully signed up. Much to my regret now, I hated the lessons and stopped soon after. The desire to learn obviously never came from within. Fast forward to about 3 years ago, I came dangerously close to buying Guitar Hero. Avoiding that precipice, I decided to try real guitars again. Do you have any tips? What is your favourite chord progression? If you could cover any song what would it be? “Jings. Well, it depends why you want to learn. Guitar Hero is a really fun game and not really related to the playing of the guitar, but if you’re dead set on learning to play a musical instrument, firstly I’d recommend getting a beginner’s guitar. Something cheap or something second hand. Don’t pick up a Fender or a Martin until you’re good enough to play one! Apart from that, just practice as much as possible and take your time. If you cut corners, your hands will learn the mistakes you’re making and it’ll be all the harder to unlearn them. As for a favourite chord progression? I don’t really have one but often a really simple progression can make for a beautiful song with the right melody and lyrics. I’ve been meaning to send some questions to Kitty the Lion (as they have caught my attention recently). As they appear on your cited bands list, what can you tell me about them? Are there any other artists we should be looking out for this year? I see that you are a fellow wordpress blogger and pretty active in most forms of social media. (Looking forward to the next ‘#shamblesiswatching’). Do you think these tools are enough for an artist to launch and sustain a career? How would you describe the music scene in Glasgow? It is a question we like to come back to a lot because we are on the other side of the world. When I look at the gigs and wonderful lineups a tear will start to form. But what is it really like there on the ground? Locally, we’ve got Twilight Sad to look forward to on March 8. What was the last show you attended? Where do I start? I couldn’t just have one favourite, but the one I tend to perform live is “Waiting for the Great Leap Forward” (eagle-eyed folk might have spotted a video of me performing this one live, roaming around the internet somewhere). Pop music can absolutely change someone’s perspective. Music does that every time you listen to it; pop music isn’t exempt. Pop music doesn’t just mean Rihanna, Jessie J, and songs about shagging. I’m tempted to ask you a Skyrim question, but I’ll ask about the ‘dragon slaying’ motif I think I’ve noticed. What are your dragons? I bought my wife (the Decembrists fan in the family) Colin Meloy’s ‘Wildwood Chronicles’ as a stocking stuffer . I noticed your involvement in ‘How to be a Ghost’. Did you do the illustrations? Have you written the song for it yet? The Beer Song references Irn Bru prominently. Isn’t that a soda? Lastly, we often ask a question to be asked of us. We then pretend you’ll check back and read the answer. What would you like to know? Once upon a time, I was able to see Mogwai and Urusei Yatsura twice in one week. Meeting up with a friend of a friend of Yatsura I’d met at the first show, he’d brought along his neighbour who a young Mr. Braithwaite took a fancy to. We ended up hanging out, sitting at the Yatsura table drinking copiously and having a good time as it was Yatsura’s release show for their first full length. Heading out from the venue to find the night bus, James pulls out a bottle of Irn Bru he had obviously been carrying all night. It was a pretty magical moment, never having had one. I’ve always thought that was merely about a man and his beloved soft drink. I’m pretty sure now he must have been wanting to get a head start on taming the inevitable hangover. 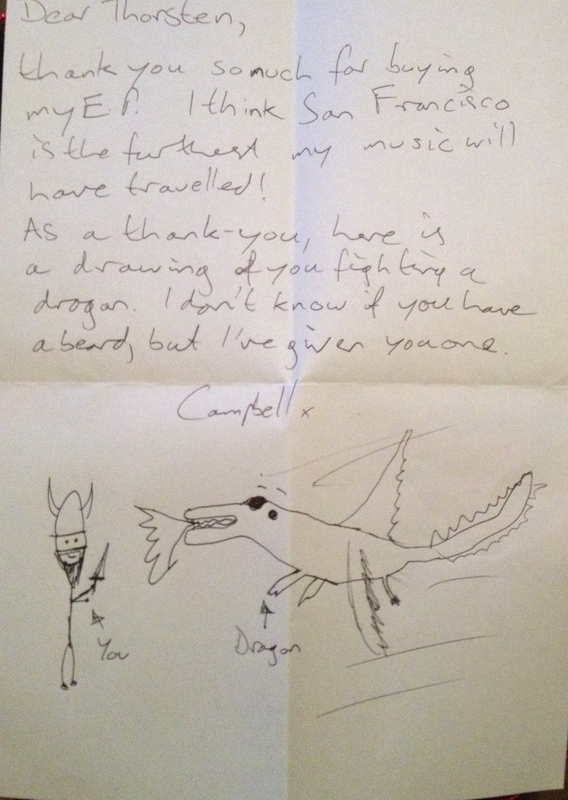 I do have a beard! 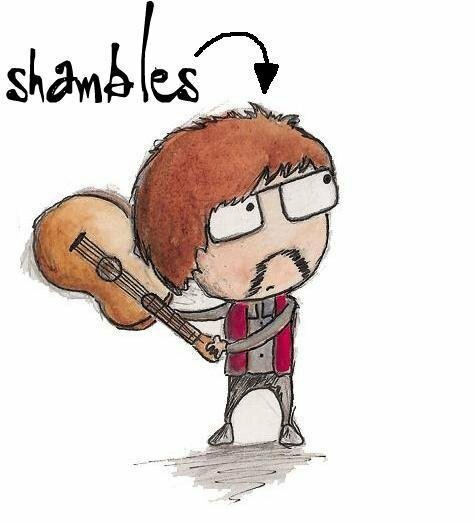 This entry was posted in Bands We've Chatted With and tagged Shambles Miller.